Galaxies are among the most fascinating objects to be photographed, their light emission comes mainly from the stars so it has a continuum spectrum. For this reason, the primary capture method with CCD cameras is through RGB broadbandfilters ot get true-color images. Some spiral galaxies, however, are very rich in HII regions, areas in which star formation is particularly active, and emit mainly hydrogen spectrum whose main emission line in the visible, called Hα (H alpha), is in red at 656.28 nm. Recently I began to take astronomical pictures in narrow band using my SBIG ST2000XM and a set of Baader Filters (Hα, Hb, OIII and SII). One of the most famous color composition technique of narrowband data is the Hubble Palette that gives to nebulas a typical golden-turquoise color palette. In this composition the SII emission is associated to Red, OII to Blue and H alpha to Green. The drawback of this composition is that, since Hα widely dominates on OIII and SII emission, OIII and SII image histograms should be boosted relative to Hα, this bloats stars and creates weird magenta halos. 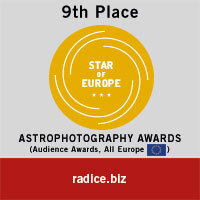 I recently participated in an astrophotography processing contest promoted by Martin Liersch website. The contest was focused on a picture of M8 taken on a quite light polluted sky: this image is an example on how PixInsight could be great on dealing with such problematic pictures. As everyone knows PixInsight is a formidable tool for deep sky astrophotograpy processing: it gives to the imager a lot of tools that goes from preprocessing to the final touch on any astronomical picture. Less knows that PixInsight is a powerful tool for planetary processing too. 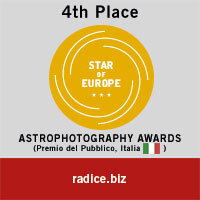 In recent years narrow band filters astrophotograpy has spread widely among amateurs for various reasons. Personally I chose this technique because I can successfully take pictures from skies with a certain amount of light pollution. The better targets for this kind of photography are emission nebulas like HII regions and planetary nebulas, objects in which the light emission occurs in narrow spectral bands.